There are so many little moving parts involved in your garage and garage door, so you�ve probably never taken the time to learn about all of them. But there can come a time when something breaks and your door stops working and you might have be involved in the process of picking new parts to fix it. If this ever happens, we want you to be prepared and know a little bit about the parts that go into moving your garage door up and down every day. So today, we will teach you a bit about the two kinds of springs you find in garage doors, torsion and extension. Let�s start with torsion springs, which are newer. They are called this because where extension springs extend, torsion springs use torque to raise and lower the door. They are attached above the garage door opening and the spring turns as the door moves. Torsion springs tend to be stronger and more durable than extension springs. And though they are more expensive, they last longer, between 15,000 and 20,000 cycles as opposed to 10,000 cycles with extension springs. They also offer greater balance and show more control when moving, not jerking as the door moves. And torsion springs tend to be safer since the spring is installed around a spring bar so that if it breaks, it will make a really loud noise but the spring itself won�t move. Extension springs are the older and less expensive technology. Mounted on both sides of the garage door, they extend when the door is in motion, using counterbalance force to support the weight of the door. Though they are cheaper, there are some downsides that you should keep in mind. They require more parts so it isn�t as easy to clean and maintain, they don�t last as long, and they need to be installed with safety cables so that in the case of a spring breaking, it won�t go flying somewhere in the garage which can be very dangerous. One pro that the extension springs have is that they don�t take up as much space above the door so those with smaller garages have another option or perhaps don�t have the room at all for torsion springs. Extension springs have been used for openings garage doors for years and are very common. But if you want to know more about installing the alternative torsion springs, call a professional and see if it can work for your garage. We always recommend calling an expert for any replacement or repair jobs and advise not doing it on your own. Garage doors use a lot of tension and heavy duty parts to move and these can be extremely dangerous if you don�t know what you�re doing. 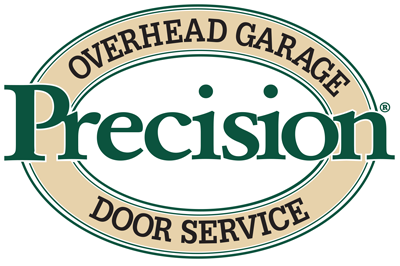 So let our expert technicians at Precision Door be the ones to help and call us today if you have any more questions!